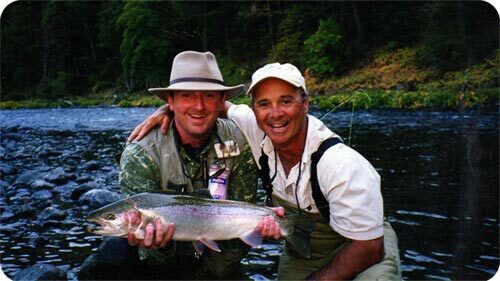 Trinity Fly Shop | Why Hire a Trinity River Guide? Fishing Guides are for everyone. 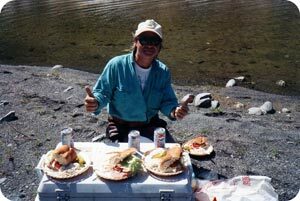 Whether you are an eager beginning novice in search of education and a basic foundation to fly fishing, an intermediate angler seeking to hone particular methods of approach or even the advanced angler without sufficient time out on the water to dial in on current conditions, hatches, or fish movements and migrations…Fishing Guides are for everyone! There is no text book, web site, DVD or better way for anglers to become familiar with a particular approach or fishery than to hire a professional guide. By doing so anglers will save an immense amount of trial and error and greatly eliminate the guess work of how-when-where. We do, however, urge you to check the credentials of the guide service of your choice. It is extremely important that the guide you select is properly knowledgeable and an accomplished professional; make sure they're licensed, bonded, insured and permitted. A professional guide has an obligation to both himself and his clients to help make their day as enjoyable as possible while teaching and educating them about the sport and the resource. It is not all about catching! Each guide has his or her own approach. We at Trinity Fly Shop strive to teach all anglers based upon age, desires and individual skill levels. Ideally, we focus on helping each angler develop a thorough understanding of the sport and our valuable resources. This includes understanding the watershed and its fish populations, fish identification, migrations and behaviors. Our on-the-water approach allows anglers to identify preferred waters, proper fly selection and coordination with appropriate waters, learning about aquatics and hatch matching, and finally, understanding various water types, proper stream etiquette and safety. Hands-on demonstration of casting, wading, and fishing particular techniques (dry-wet-streamer-dead-drift/swing) allow anglers to always be "totally involved" in the learning process. Last but not least, you can be assured you will be escorted to fishing waters that offer you and your talents strong promise for success. Success greatly depends upon each angler's ability to listen, learn, and perform. In essence, the guide is attempting to fish through each angler based upon what was taught and demonstrated. Ultimately, it all will come together for you … a well educated angler, tight line success and perhaps most importantly we will have developed a friendship that will inspire you to return again and again. 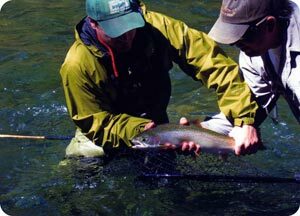 Call (530) 623-6757 or e-mail trinflyguy@shasta.com for rates, reservations, and further detailed information....Your "Local Source" for a quality Trinity fly fishing experience!